Ten years ago, Hoopes Vision brought the first WaveLight® Allegretto excimer laser to Salt Lake City. It was by far the fastest and most precise vision correction laser available to date and was the first generation of excimer laser to perform wavefront-optimized procedures. (Wavefront optimization, by helping maintain the natural prolate shape of the cornea, results in reduced issues such as nighttime halo and glare when compared to earlier generation lasers.) Even at the time, Dr. Hoopes recognized it as a major leap forward in laser technology and acquiring it as another example of Hoopes Vision’s commitment always to offer the safest, most effective vision correction procedures available. Over 60,000 WaveLight® procedures later, that is still our commitment. And in keeping with that commitment, Hoopes Vision became one of the first practices in the country to own the new WaveLight® Refractive Suite, the newest advancement in laser vision correction. The WaveLight® Refractive Suite allows Hoopes Vision to offer patients in Utah the fastest, most precise, and most comfortable laser vision correction available anywhere. It represents a true step forward in refractive laser technology, bringing together two upgraded lasers in one innovative combined system. The WaveLight® FS200 is the fastest of its kind, creating the LASIK flap bladelessly in as little as six seconds, nearly twice as fast as the last generation of femtosecond lasers. This means a more comfortable experience for the patient. Like its predecessor, the WaveLight® Allegretto Eye-Q, the WaveLight® EX500 performs wavefront-optimized corrections that maintain the natural shape of the cornea, reducing nighttime halo and glare. However, the improved speed of the EX500 leads to improved precision, which in turn can lead to improved patient outcomes – meaning even better vision, day or night. 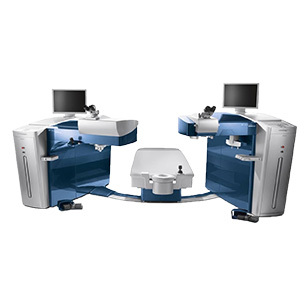 Finally, these two state-of-the-art lasers comprise a single refractive laser suite, linked by a wireless connection and a swiveling patient bed. The connection means that the patient’s custom treatment plan is instantly communicated to both lasers, saving time and ensuring perfect accuracy. The swiveling patient bed allows the patient to undergo the entire LASIK procedure without having to move from one laser to the next, making for a smooth, pleasant, comfortable experience on the day of surgery.